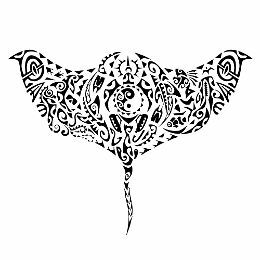 Guy asked for a manta back tattoo to celebrate is 100th dive, with marine life and scuba diving equipment disguised in it. The central turtle includes a yin yang symbol made of a wave to symbolize the harmony and balance found in water, with two sharks swimming around it in a circle. On the left wing, a seahorse becomes the body of a tiki, which brings protection from all sides together with the tiki on the right wing. Next to it there are a dolphin and an octopus. An otter swims below the turtle towards the tail of the manta. On the right wing there are a whale shark, a nudibranch, a clown fish and a lion fish. Disgused in the design we also included a canoe, a frigate, a fish hook, fish and shark teeth, while the scuba equipment includes mask, fins, diving tanks, snorkel and a compass on top over the turtle.